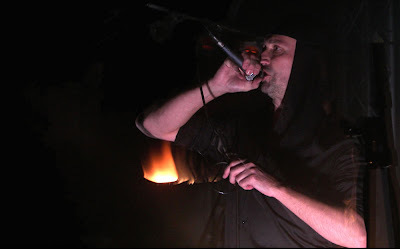 The Heaven and Hell Tour: Laibach at The Postbahnhof, Berlin. In a renovated former Eastern Sector railway warehouse, a dark and brooding figure dressed in black and a distinctive leather mining hat can just be seen in the stage fog. He stands, head bowed, in the gloomy shadow whilst a pair of synthesisers fight each other across the stage with discordant noise and deafening exploding cymbal crashes. Meanwhile a severe looking woman with slicked back short hair, dressed in a short skirt matched with black tie and military shirt, strides around the smoking battlefield in six-inch-heeled boots barking guttural German into a loudspeaker. It could only be the beginning of a Laibach concert, couldn't it? From the opening number of 'Sredi Bojev' out of the early 1980's, Laibach force-marched us through a set list which took in most of their milestones. But it wasn't just a journey down a bombed-out memory lane; the standards were apocalypticly re-arranged and re-interpreted, sometimes almost beyond recognition. It was an older, warier, wearier Milan Fras who put melancholy and yearning into his vocals tonight; the kind of feeling that can only be imparted after a life which has seen totalitarianism and war, and drug-addiction, and death. And liberation and life. Though Fras performed a lot of the tracks from their early days, Laibach were past the gimmicky trapping of militarism and pseduo-fascism of their youth. Instead they gave us their virtuosity at creating a wall of richly-layered drums and synth, thundering with energy and violence, and without a single miscued sample loop or mis-hit snare. The imposing and sexually dangerous Mina Špiler (who sang with Fras on the Mina Harker remix of 'Ohne Dich' , Rammstein fans take note) held her own centre-stage at the keyboard against a back-drop of blinding explosions of light and screen-projected marching skeletons. Meanwhile Fras kept to front-right of the stage, alternately imploring the fans with outstretched muscular arms or retreating into the shadows with a fixed glower. The audience seemed almost transfixed with awe, like the congregation at a Satanic ceremony. Only when 'Tanz mit Laibach' stomped across the back-screens did they show any enthusiasm for movement. All too soon Laibach had given us a single encore of 'Life is Life' and were gone. The house lights came up and the spell was broken. 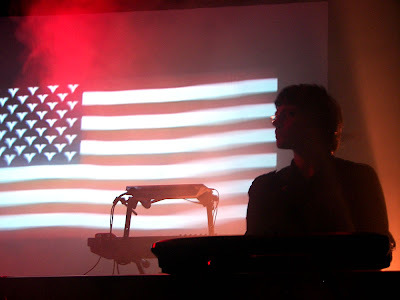 Laibach were joint-headers on this 'Heaven and Hell' tour with Juno Reactor. Which one Juno Reactor were meant to be was unclear, but they were certainly at the opposite pole to Laibach. The South African drumming and dancing was energising for a while, but soon got tiring. We left before the set ended and drifted away into the cold, grey, misty night of Berlin. Leave Juno Reactor's world music for bright Summer days - Here and now, Laibach was more fitting to the Ortgeist. Fröhliche Weihnachten bei Schloss Rammstein!